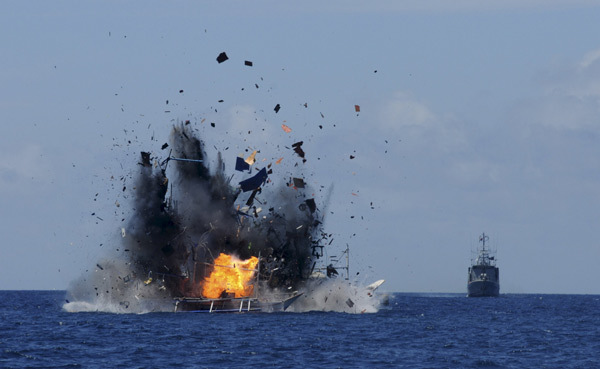 China Daily /JAKARTA, Indonesia – Indonesian authorities blew up and sank 41 foreign fishing vessels Wednesday as a warning against poaching in the country’s waters. The vessels from a variety of countries were blown up in several ports across the archipelago, which has some of the world’s richest fishing grounds. Navy spokesman First Adm. Manahan Simorangkir said 35 vessels were sunk by the navy and six by the coast guard police. Fisheries Minister Susi Pudjiastuti said Indonesia has blown up several other boats since the current government took over last year after President Joko Widodo was elected. Part of his platform was to preserve Indonesia’s oceans to ensure future generations will benefit from its rich waters. The boats, seized from Chinese, Malaysian, Philippine, Thai and Vietnamese fishermen, were blown up on National Awakening Day, which commemorates the first political movement toward Indonesia’s independence. This article is orginally published in China Daily.